PolitiCall makes it easy to get in touch with both the Senate and the House of Representatives so you can make sure your voice is heard by the members of Congress who represent you. Get it for free on the App Store. Browse the entire list of Senators and Representatives or search for your reps using a contact or address. Swipe from the list to call or tap on a member of Congress for full contact information. On an iPad? You can even drag and drop. Use PolitiCall for iMessage to loop in friends and family, so they'll always know who they can contact in Congress. 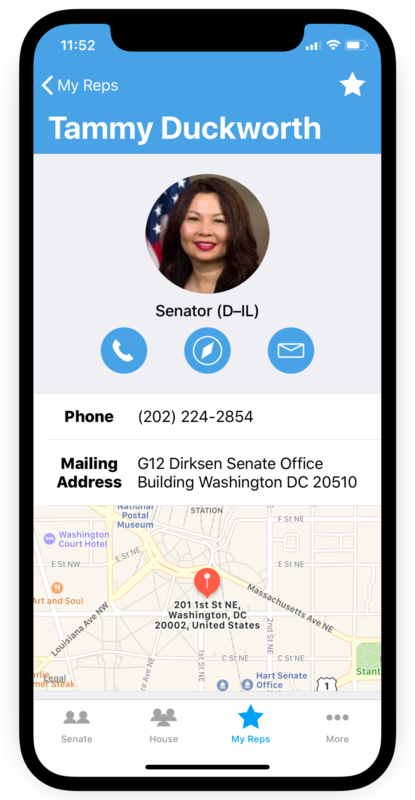 PolitiCall for Apple Watch makes it easy to stay in touch with your representatives on the go. Start a call on your iPhone from your wrist or set a reminder to call later. Got an Apple Watch with LTE? You can even start a call with your rep without your phone nearby.